Another week and everything is STILL a soggy mess! It looks clear over the weekend – clear and hot, so everything can burn to a crisp! (I’m in a really cheery mood today, aren’t I?) We had our Demo Garden work day this morning, since we got rained out on Tuesday. We have been seeing TONGS of these tiny little grasshoppers all over the garden. They are still quite small to cause major damage, but I’m not looking forward to all the big grasshoppers in a month or two. I took a peak at the squash under the row cover this morning, and they are looking great! They are at least twice as big as the squash that aren’t under the cover. Extra warmth, and less beating from rain and wind really do wonders! Unfortunately, the weeds under the cover are twice as big too. 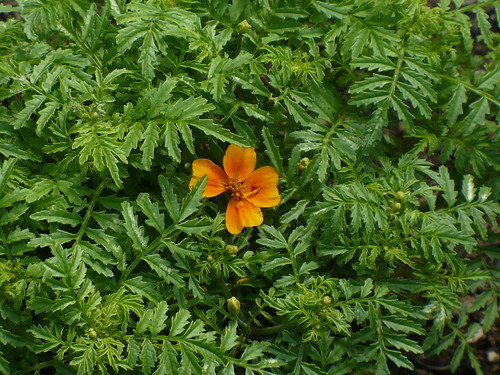 The very first citrus marigold flower, on the ‘Tangerine Gem’ plants. Look at all those buds coming! These will be really pretty in a couple weeks. 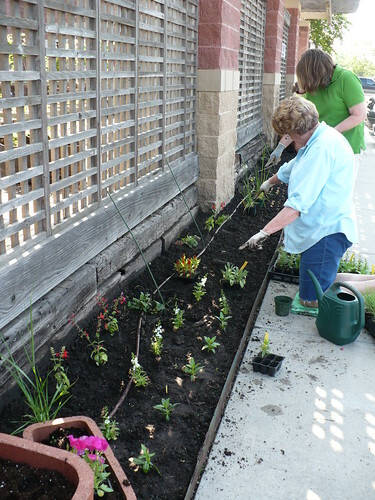 Two of our Master Gardeners are conferring over which annual flowers should be planted where in our front lattice garden. We are trying out a bunch of Prairie Star annuals and some Prairie Star annual trials. Except for the Chinese (Napa) Cabbage that is getting really big and beautiful, all the other Asian greens got pulled out to make way for our summer vegetables. 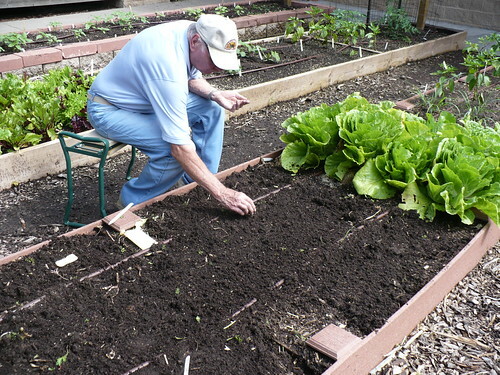 Here a Master Gardener is planting ‘Suyo Cross’ Japanese Cucumbers where those greens used to be. This is probably an ironic topic to be discussing, since we seem to be getting regularly deluged with far more rain than we really need, but I recently read an article in a trade magazine about correlating tomato flavor to the amount of water the plant receives. 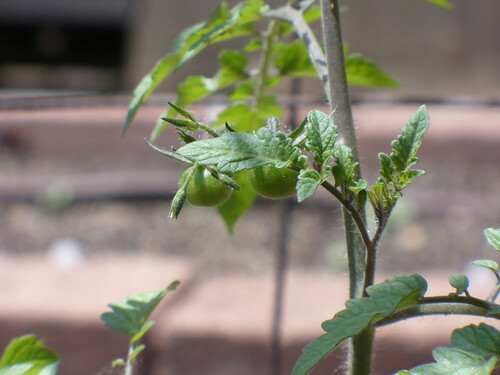 Researchers did a study where they watered tomatoes at 0%, 25%, 50%, 75%, and 100% of evapotranspiration (ET). (Evapotranspiration is a fancy way of saying that they measured how much water was lost from the plants during each day. Just think how much that could be on a hot, windy, Kansas day!) So suppose that the plants lost 10 oz of water (I’m just making this up.). Some of the plants then received 0 oz of water, 2.5 oz, 5 oz, 7.5 oz, and 10 oz of water. This was done consistently from 1 week after transplanting until the end of the season in a cool coastal area and after flowering in a hotter, dryer location (like Kansas). Taste test panels preferred the flavor of fruit grown in the 0, 25, and 50% plots. Lab tests showed that these tomatoes were higher in sugars, soluble solids, and lycopene. Fruit color was good in all trials. 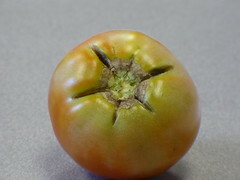 Skin toughness was only reported in well-watered tomato fruit. Total yield was not significantly different between the trials. Marketable yields were lower in the most water stressed plots. The 0, 25, and 50% plots had fewer large and extra-large fruit, more insect and disease damaged fruit, more blossom end rot (duh! ), and more sunburn. So, tomatoes receiving less water are tastier and the lost yield isn’t significant in most cases. Interesting, wouldn’t you say? Of course, I have to try something like this now, with my penchant for science projects. I don’t have a way to measure evapotranspiration, but we do have a garden on our grounds that is intended to be low-water. The garden is our “EarthKind” soils demonstration. The soil is heavy clay that has been amended with 3″ of expanded shale and 3″ of compost, and then mulched on top. This preparation is supposed to improve drainage in heavy clay soils and also prevent the need for frequent watering. (If that makes any sense, whatsoever.) 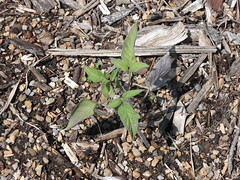 Anyway, I planted 5 tomato plants out in our EarthKind Soils demo area (I think a Solar Fire, Brandymaster, Sweet Cluster, …and I forget the rest.) It will be interesting to see how much trouble we have with Blossom End Rot and also if they taste better than our sometimes-overwatered plants in the Demo Garden! In my opinion, things are looking a bit rough out it the garden today. For some reason, cool temps with buckets of rain, followed by hot sun and wind is not a recipe for gorgeous gardening success! The first thing I noticed when I walked out to the garden this morning is that about 25-30% of the sunflower seedlings are flopped over, almost like they are broken off at the base. Upon closer inspection, it appears that they are suffering from some sort of damping off type disease. 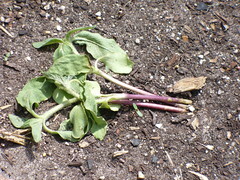 The wet soils caused the stems to start rotting, and then they flopped over in the wind. We will either have to plant some more seeds or find some different flowers to plant in that spot. UPDATE: Bob, our other Hort Agent said that he thinks it looks like sunflower cutworm that chews on one side of the stem and then the plants flop over. Could be possible. In any case, there’s not much we can do about it! The other plants that I’m pretty concerned about are the peppers. They were a little too leggy when we transplanted them, and they haven’t really grown much since then. Granted, the weather hasn’t really been ideal for fast growth, but they are developing more flowers and little peppers that I really don’t want to pick off. However….I really think we’re going to have to if we want the plants to be in good shape going into the summer. Some fertilizer is definitely called for too! Lots of things in the garden are looking (surprisingly) a little dry. I know that this is just because they are so used to being soaked after the last 2 weeks that even a little drought stress is hard. The plants probably suffered some root loss when the soils were saturated too. 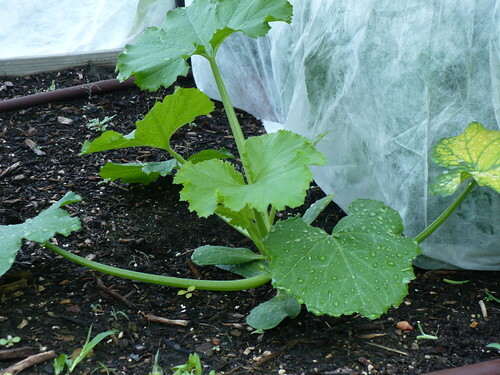 Then there’s the squash plants. 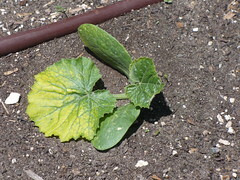 One variety, ‘Soleil’ yellow zucchini has a bright yellow leaf (like nitrogen deficiency) on all the different plants we have in the garden. Normally I would just call it nitrogen deficiency due to all the rain, give it some fertilizer, and let it go at that. In fact, that’s still probably what I’m going to do, unless something more drastic happens. However, another squash variety right next to it looks completely healthy! No signs of insects or anything else going on. I’ve almost had my fill of gardening mysteries for the year! Hopefully we are sort of back to some semblance of a schedule with the Friday PhotoEssay. Ah well…if I don’t get it posted, you can always check out all the pics from the week on Flickr. 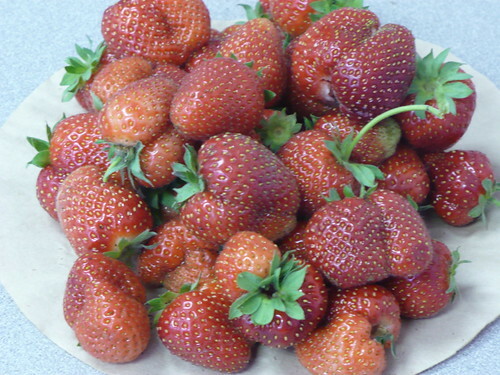 We started the week with just a few strawberries here and there…some pretty, some not so pretty. Some eaten by roly polys, some eaten by robins, some eaten by me. By today, we have probably a solid quart of berries, after getting about half a quart yesterday. Berries ripen so fast when the sun comes out and it gets warm! 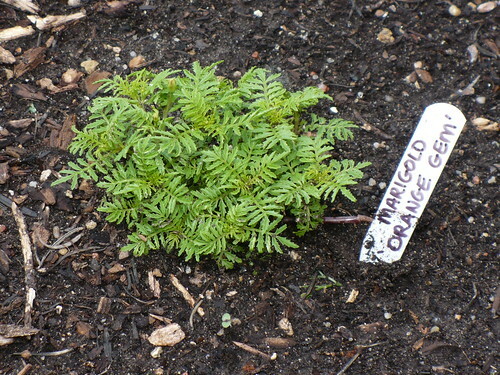 I love citrus marigolds. They smell citrusy rather than marigold-y. They have pretty, delicate foliage, and the are a nice round ball-shaped plant covered with dime-sized flowers when they mature. Oh yeah, and did you know that they’re edible? 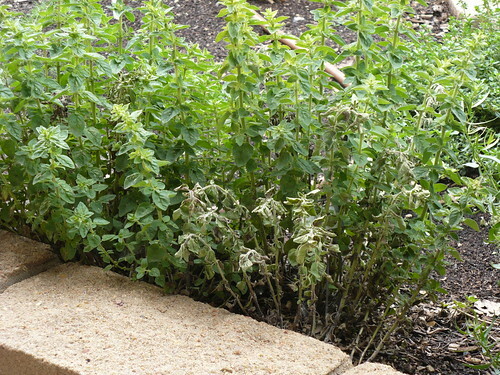 This oregano is something of a mystery to me. Parts of it are starting to wilt and look terrible. It did the same thing last year…parts of it wilted, then more of it wilted, then we cut it back and it came back and was beautiful. It kind of looks like it’s g0t Verticillium wilt or nematodes or something, and it is partially fighting it off. Not sure how I missed these little guys until this point. I blame it on the rain! I was beginning to feel left out, since other bloggers in the area were reporting baby tomatoes. Now I feel better…even if they are just on the SunCherry plant in the Family of 4 Garden. I knew you were all waiting for this one! 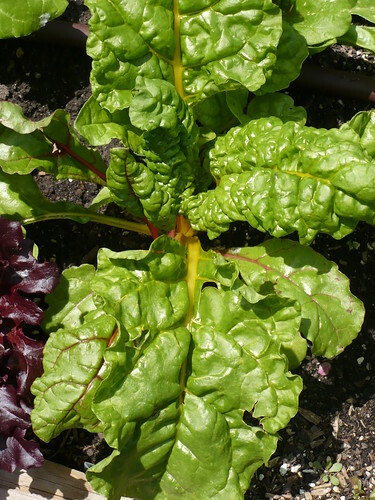 It’s the first Swiss Chard picture of 2010! What can I say? Swiss Chard is almost as photogenic as a cute toddler, even with slightly hail-battered leaves. We gave our first shot to cooking and eating the Hon Tsai Tai tonight. Honestly…not so impressed. However, I think I know how to rectify the problem for next time. I cut the bottom 3-4 inches off the stems, because I’d read on a couple other sites that the stems can be extremely woody. Then I just chopped the entire thing…leaves, stems. and flowers into 1-1 1/2 inch pieces. 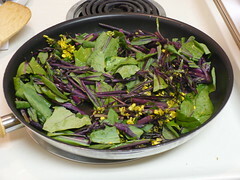 Let me pause for a minute and say that even if I never figure out how to cook this stuff the right way, the purple stems, green leaves, and yellow flowers make it pretty enough to just throw in a vase and forget about the edible part. Next I mixed up the sauce for the dish. 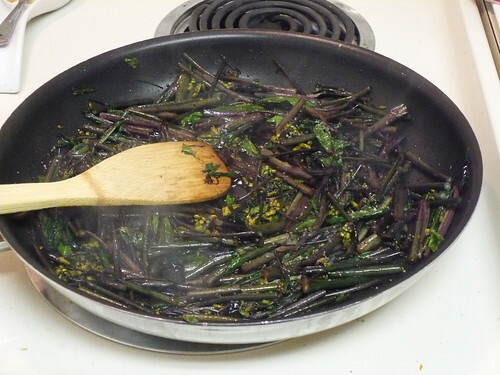 Most of the recipes I had found recommended stir-frying in oil with some combination of Asian seasonings. Since we like Asian food, we have hoisin sauce, dark soy sauce, and sesame oil on hand. I mixed up a little hoisin, a little dark soy, a little sesame oil, some ginger, and some garlic powder (I was too lazy to chop fresh ginger and garlic for this). After heating the pan with a little oil, I tossed in the chopped Hon Tsai Tai and gave it a dash of salt and pepper. After it was partially cooked, I added the sauce to finish the cooking. It definitely looked and smelled very tasty, even if that was just the tasty sauce talking. I will admit, I probably over-did it with the sauce. It pretty much overpowered the flavor of the veggies. But you know, I’m not much different from anyone else trying something new. I’m afraid that it’s going to be distasteful, so I slather it in something I know I do like! So…unfortunately, the consensus was that we harvested it too late. 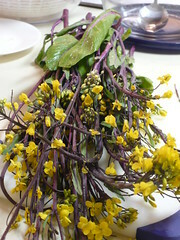 The larger stalks were like chewing on logs, and the smaller stems were like crunchy, fibrous twigs. Occasionally we would find a stalk that was tender, and the flower parts were fairly tasty – what we could taste underneath the sauce. The matter of harvesting past the ideal stage is really my fault. In the back of my head I knew that they should be harvested younger, but my desire to get a decent yield convinced me to let the stalks get bigger. The plants just aren’t as big as I thought they would be, and they aren’t producing many good sized stalks. 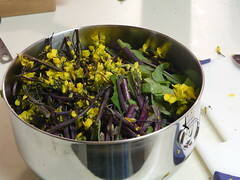 I’ll try harvesting some more tender shoots and cook them again (maybe with less sauce!). My conclusion may be that if you want to grow Broccoli Raab, you should grow an Italian variety. 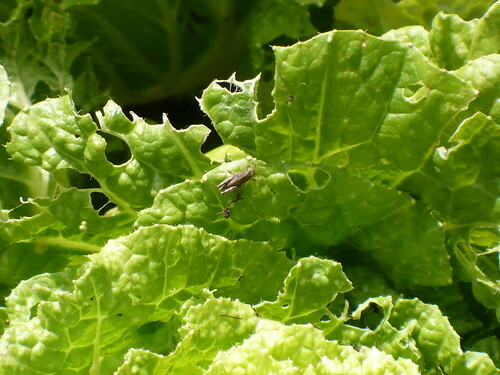 It might also be the case that the plants would be bigger and more productive grown in the fall rather than the spring. Speaking of spring…We’ve recorded another 1.3 inches of rain in the last 36 hours. 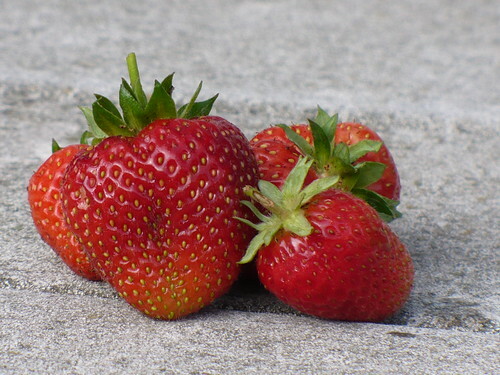 I’m going to go console myself with strawberries.